Separated by a common language, sometimes following recipes in the US / UK can prove difficult if you’re apparently not familiar with the ingredients mentioned. Here is a simple run-down of equivalents that I hope will help. Please let me know, by leaving a comment below, if you come across any more and I will include them. Place the cream, onion or shallot and the thyme sprig in a small pan. Slowly heat to just below boiling point, then remove from the heat and allow to cool. Strain, discarding the onion and thyme. Heat oven to 160C / 325F / Gas 4 / (Fan oven 140C /275F). 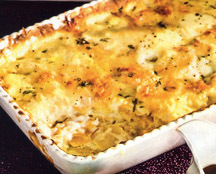 Rub the bottom and sides of a gratin dish measuring about 20 x 30 cm (8 x 12 in) with butter. Peel the parsnips and trim the ends. Peel and scoop the seeds out of the squash. Thinly slice the vegetables. Layer the parsnip and squash in the dish, pour over the infused cream, then scatter with the thyme leaves and Gruyere cheese. Bake for 1 hour until golden and a fork slides easily into the veg. Get Ahead: Leave the bake to cool, then cover and place in the fridge for up to 2 days. To reheat, place in a 220C / 425F / gas 7 (fan 200C / 400F) oven for 15 minutes. If the top starts to brown more than you’d like, cover with foil. 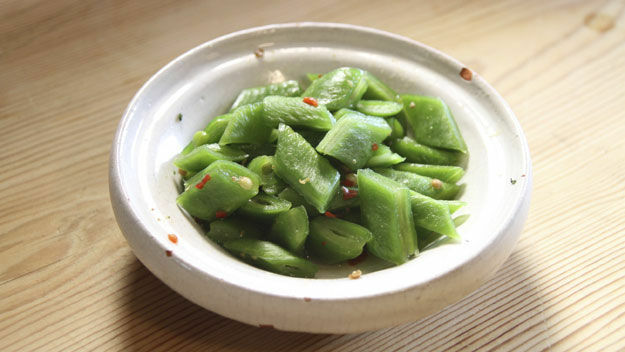 Incredibly simple – utterly delicious. Peel the carrots and trim off the ends. Cut in half lengthways, then cut on the diagonal into slices about 1/2 cm (1/4 inch) thick. Place the carrots in a steamer basket and steam for 5 – 7 minutes until softened, or place in a heatproof bowl with a little water and microwave on ‘High’ for 3-5 minutes. To finish the dish: Gently heat the butter in a frying pan. Tip in the caraway seeds and cook for 30 seconds until they start sizzling. Add the carrots and stir into the butter until glossy and heated through (about 3 minutes). Toss through the parsley and serve. 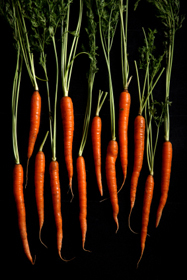 Cook the carrots up to 2 days in advance, leave to cool, then cover and store in the fridge. Reheat in pan, finishing with butter and caraway seeds as above, just before serving. Put the lemon juice into a large bowl. Peel the apples and pears, leaving the stalks on, then toss in the juice. Meanwhile, bring a medium saucepan of water to the boil. Lower in the apples and pears, then cover and poach for 30 minutes or until the fruit just gives to a sharp knife. Peel the shallots while you’re waiting. Heat the oven to 190C / 375F / Gas mark 5 (170C fan oven). 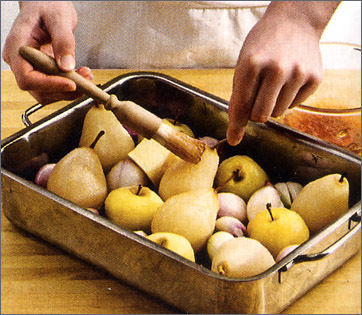 Add the oil and butter to a small roasting tin, then add the drained apples, pears and the shallots. Brush the fruit with a layer of the quince or redcurrant jelly **(cranberry jelly would work equally well)** and roast for 1 hour until softened and golden. Turn the pears and apples around in the fat a few times during cooking, brushing twice more with the glaze. Serve spooned around the turkey, decorated with bay leaves. This recipe has been very slightly adapted from a recipe that first appeared in the December 2007 Christmas edition of BBC Good Food magazine. The photograph is from the same source. 1. For the citrus chicken: lay the chicken fillets between 2 sheets of greaseproof paper and use a rolling pin or meat mallet to flatten them out to about 5mm thick. 2. In a large, shallow dish, mix together the lemon and lime juice and zest, olive oil, coriander and salt and freshly ground black pepper. 3. Add the chicken fillets and coat thoroughly in the marinade then cover and chill in the fridge for at least an hour, preferably overnight. 4. For the chilli new potatoes: parboil the potatoes in a large pan of boiling, salted water for 7-10 minutes. Drain well then cover with a clean, dry tea-towel to absorb any excess moisture. Set aside to cool slightly then cut into diagonal slices. 5. Melt the butter and oil together in a large frying pan over a medium heat. Add the chilli and the potato slices and fry for 10 minutes, turning halfway, until crisp and golden-brown. 6. To cook the chicken, preheat a griddle pan over a high heat (you could also cook the chicken over the hot coals of a barbecue). 7. Place the chicken fillets on the griddle pan and cook for 5 minutes on each side, or until charred on the outside and cooked through. 8. 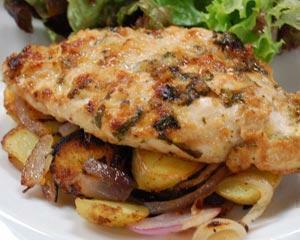 Serve the citrus chicken with the chilli new potatoes and green salad alongside. This recipe apparently has a silly amount of garlic in it but don’t be put off and don’t be tempted to reduce the quantity. When garlic is roasted it loses its pungency and instead takes on a mellow sweetness that works well with the lemon flavour. Preheat the oven to 170C (325F), gas mark 3. Heat a large casserole or saucepan over a medium heat. Add the olive oil and chicken pieces, skin side down and cook on both sides until golden brown. Season with salt and pepper. Pour off and discard any excess fat. Add the wine and garlic cloves and boil for 2 minutes. Next add the lemon zest and juice, the herbs and the stock. Bring to the boil, cover and bake in the oven for about 30-40 minutes, or until the chicken is cooked. To cook the rice: melt the butter in a casserole or saucepan that is large enough to accommodate all the rice (bearing in mind that it will swell). Add the onion and season. Cover and cook over a low heat for approximately 10 minutes, or until the onion is soft. Add the rice and stir for about 2 minutes until it crackles, then add the stock and some salt and pepper. Bring to the boil then transfer to the oven and cook for about 10 minutes or until the rice is just cooked so that it is slightly al dente and all the liquid absorbed. Serve the chicken with the rice in shallow bowls and sprinkled with chopped parsley.